I was recently talking to a fellow security professional who develops secure plug-ins for browsers and we started talking about the security of various different browsers. Most of the talk around browsers centres around how fast they are and what sort of features they have, but rarely do people talk about the security of their browser. Unfortunately, the browser is one of your weak points on the network as users have the ability to navigate to sites containing malware or phishing attacks as well as install plug-ins or run scripts that are malicious. So, which browser is the most secure? Any guesses? All browsers (and all security products for that matter) have security weaknesses and vulnerabilities. However, the architecture of the browser and certain features can make browsing safer. The feature I'm going to put forward first is web browser protection against socially-engineered malware (phishing sites). According to many of the big AV and security vendors, phishing is on the rise and set to be the biggest headache of this year. Two statistics worth quoting are: according to Trend Micro, 53% of malware is delivered via Internet downloads against only 12% via e-mail; and Microsoft claim that 0.5% of the download requests through IE8 are malicious and they block a download for one in 40 users every week. In January 2010 NSS Labs tested five of the latest browsers against socially-engineered malware. Their full report is worth reading, but I have shamelessly reproduced their main graph here. According to NSS Labs, Internet Explorer 8 blocked 85% of these malware sites using their SmartScreen Filter. The next nearest was Safari 4 at 29% and 0.2% behind that was Firefox 3.5. Chrome 4 was worse, on only 17%, and Opera 10 was bottom of the pile, achieving less than 1% blocking. By far the best of the pack was IE8, but even that still lets through 15% of malware. An interesting and noteworthy aside to this is that I believe Safari and Firefox use Google's Anti-Phishing API and achieve a 29% blocking rate, yet Google's Chrome only achieves 17%. If you want to see what the SmartScreen blocking looks like in IE8, you can see an example below, where IE8 is blocking it and Comodo's Dragon (a Chrome derivative) is not. Also, again according to NSS Labs, Firefox had an 'average add time' of 5.7 hours, the fastest, versus Microsoft's 6.7 hours. The average add time is how long on average does a user have to wait before a visited malicious site is added to the block list. Speed is very important here, but it does actually have to get blocked in the end to make this a valid metric. These figures are better than the other three browsers, which scored: Safari - 9.0 hours; Chrome - 14.7 hours; Opera 82.4 hours. Having mentioned Comodo's Dragon now I will give you a brief introduction, if you haven't heard of it before. It is a free Chrome derivative browser from Comodo. This browser has been designed to be more secure than the average browser. It doesn't perform well in the above tests, but has several other features up its sleeve centred around privacy. Some of the main features include not sending the HTTP Referrer so that you cannot be tracked from site to site, it won't send crash and problem reports (so your history remains on your machine only), it highlights DV only secured sites and will give a visit history with the certificates. If you don't know the difference between a DV and an EV SSL/TLS Certificate then read this blog post. 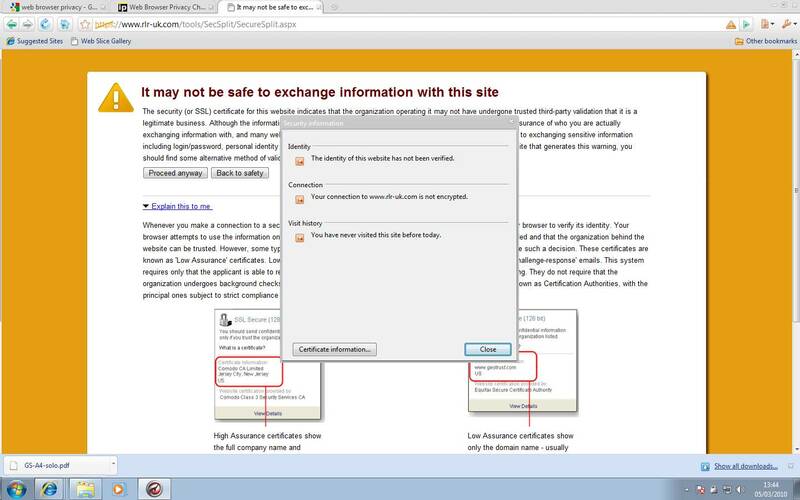 An example of the DV certificate warning can be seen in the screenshot below. One problem I have with the privacy tag associated with this browser is the UserAgent string. I have blogged about Cookieless Browser Tracking by using the UserAgent string before. The point is that the string sent to a web server by your browser to identify its and your machine's capabilities gives about a third of the information required to uniquely identify you. There will only be a handful of machines with the same UserAgent string, especially if you stray from the most common browsers (IE & Firefox). I also think that 'Never save passwords' should be the default setting and 'Allow all cookies' should not be the default setting. It is a new browser though, and I'm sure it will improve over time as the company is committed to security in many guises. Certainly its positive features are good and something that other browser vendors should follow. The next point is about actual downloads from the Internet. Dragon, and other browsers, will give a warning when downloading executable files, but will just download ZIP, PDF, etc., and allow you to open them without warning. Bear in mind that PDFs and ZIP archives can contain malware. IE8, on the other hand, will ask you to confirm the software used to open a download, regardless of its type. This will always give you the chance to opt out if it wasn't what you were expecting. 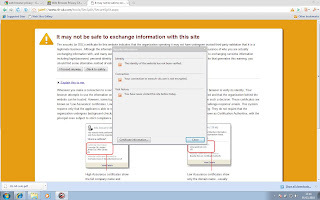 Also, IE8 will tell you if it is a signed or unsigned download, if it is a plug-in or an executable. Other browsers do not support this feature. What does it mean though? Well, if I am a software vendor, like Adobe, and I want you to download and install my plug-in I will sign it with a digital signature. When you download it, you can verify the signature, which will tell you that I (or Adobe) created and signed the download and that nobody has tampered with it in the meantime. If the download isn't signed, then how do you know that this isn't a phishing or pharming site pretending to be Adobe (or intercepting the download with a proxy) giving you a version containing a Trojan or some other malware? The answer is that you don't! So, you should only download and install signed plug-ins and executables. Unfortunately, Internet Explorer is one of the few browsers that will control this for you and it makes a distinction between signed and unsigned plug-ins even when they are installed. Which brings me onto my final point (as this post is getting very long and a bit like a rant). Internet Explorer is, I believe, the most attacked browser as it has, until recently, been the most widely used. Due to this, Microsoft has had to build it in a secure fashion, controlling all plug-ins carefully. Firefox, on the other hand, performs many of its tasks by using a plug-in architecture, even for standard functionality. As far as I am aware, there is little or no distinction between a 'built-in' plug-in and one installed from a third party at a later date. This is very dangerous in my opinion. Firefox now enjoys the top position for browsers and it won't be long before the hackers make the switch from attacking IE over to Firefox. I think it will be harder to secure Firefox against this onslaught than it will be for Microsoft to keep up with their architecture. It is interesting to note that the speed of the browser runs roughly inversely to the graph at the beginning of this post, i.e. Chrome is very fast and IE is considered the slowest of the big 4. However, security always comes at a price - processing being a big loser. Could it be that the reason why IE is such a leviathan and slower than its rivals is because they're doing much more checking and keeping you much more secure? I think so. Microsoft have a way to go though and can't rest on their laurels. I will be watching Comodo Dragon with interest to see if they can really push for the top spot in terms of a secure browser. It certainly does something for user education and privacy. I have tried out GrIDsure with a set of users now to see how easy it was to use. 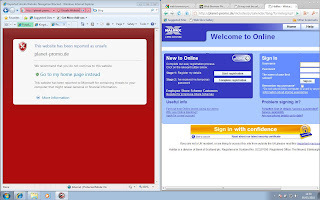 I was using the Windows client 2-factor authentication solution I blogged about here. (If you don't know their product you must read either their website or my other blog post above before reading this post as it won't make a lot of sense otherwise.) It turns out that the users had no problem setting it up and using the login - no training required other than a simple explanation of how it works. Doing this trial reminded me of discussions I had with GrIDsure about their Enterprise version of their product, which is fairly new and has more features being added all the time. One feature that I thought was noteworthy is their anti-phishing verification. 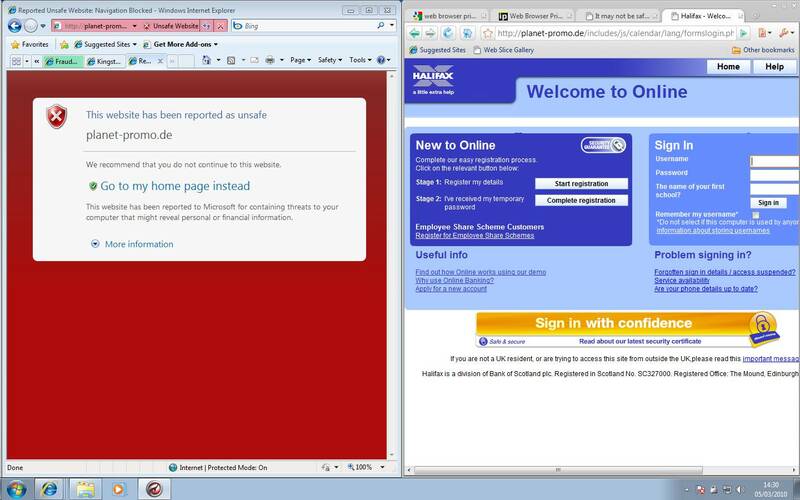 Phishing, as you will know from here, is a big problem and is often spread by obscured links in emails, such as http://www.microsoft.com.phishers.org/, which has absolutely nothing to do with Microsoft, but is just a sub-domain of phishers.org. There are many ways to combat phishing, the best of which is user education and awareness. I have, for a while, thought that a solution similar to that of MasterCard's SecureCode could be applied to many emails and on-screen login pages to verify the sender. If you're not familiar with MasterCard's SecureCode, when you set up your credit card to have SecureCode, you enter a password and a phrase that is personal to you (any phrase so long as you recognise it and someone else wouldn't guess it). When you confirm payment for something you are presented with your phrase on screen and asked to enter three characters from your password. The point is that if you don't see your phrase then it isn't MasterCard, so don't enter your password characters. The problem would be spear-phishing, targeting individual users. In this case you could just copy the phrase and fool the user. However, you can't just attack a batch of users or all MasterCard users, for example. GrIDsure have done something along the same lines to authenticate the sender of emails and other messages (with their SDK it could be made to do this for any number of situations). What their system does is send you a code which, along with your unique key, generates a particular grid. Only you can generate that grid, as only your devices have that key (devices plural, as this could be a desktop application and on your mobile phone). They then tell you what your PIN is on that grid. The verification is simple; enter the code on your device and read your PIN off the resulting grid, if it matches the one in the email it's valid, otherwise delete the email and ignore it. This is just a very simple way to verify an email to make sure that it is not a phishing scam. Of course there is one issue - replay attacks. If an attacker copied the code and PIN from the email then they could verify any email to that user. However, this does limit it to spear-phishing individual users rather than a mass blanket phishing attack. This could be reduced if a timestamp were introduced as well, e.g. entering the date as part of the code to generate the grid, reducing the window of opportunity to the same day. I would like to see GrIDsure push this and eliminate replay attacks to help stop people falling for phishing scams. More people need to think about technologies like this to verify their emails - alternatively, they could just digitally sign them all as practically all email clients have the ability to verify a digital signature.